The whole world's in a terrible state of chaos. Sean O’Casey’s 1924 classic is such a rich piece of text that it can be approached from various angles. This new reading doesn’t aim solely for its tragedy, it is more a tale of people that tragedy has already descended upon and who are stoically carrying on as more befalls them. It’s not aiming straight for the comedy either. There are a good deal of laughs, almost farce at times, but we never hear lines played just for the humour alone. What director Gemma Bodinetz has achieved here is an epic, sweeping piece of human drama that balances light and dark, and tells its story with genuine warmth of affection for the writing. The setting, a single, squalid Dublin tenement, is placed in an uneasy fractured world in Conor Murphy’s design. The one room dwelling is a skeletal affair beyond which we see into the street beyond, and this is depicted by a chaotic arrangement of discarded objects, as though someone had dismantled the entire barricade from the set of Les Mis and hurled it onto the stage. It rises to a pinnacle at one side and looms heavily over the action, and the cast weave in and out of it as they come and go like as many of the rats they live amongst. Parts of the ensemble play musical instruments from amidst this wasteland, and those not otherwise occupied perch upon it and cast their inquisitive or accusatory gaze on the story before them like some ghostly chorus. Niamh Cusack and Des McAleer are the long suffering Juno and her husband Jack, known as the paycock (or peacock) for his vainglorious strutting. Balance is the key again in these two sparring roles and they never allow their characters to become caricatures or excessively sentimental. Juno slaves away to keep her family afloat, while “Captain” Jack spends his time drinking in the alehouse with his useless bevy of friends. He seems to care little of what his family do or say unless it reflects on his own inflated sense of self-importance. The daughter Mary (Maureen O’Connell) looks for upward mobility in exchanging her original intended for the pompous, ineffectual and apparently incompetent Charles Bentham (wonderfully sculpted by Robin Morrissey), but he leaves her only one unhelpful legacy when he discovers he won’t be marrying into money. The son Johnny lives with both the physical and mental scars of his past, and some of that past’s shadows ultimately come to haunt him to tragic effect. Johnny is played by Donal Gallery, who brings a tremendous dramatic weight to the character. His last scenes on stage are filled with raw terror. A wonderful foil to Jack is his drinking partner Joxer Daly, a daarlin’ man who may well be half cut but has plenty of homespun philosophy to offer. Joxer is a splendidly cast Louis Dempsey, who again never lets his larger than life character become purely comic. Aoife McMahon is Maisie Madigan, a neighbour with sage advice but debts owed to her, and her crazed performance has some startling moments (I trust they check that table over regularly). She also cuts quite a vocal dash with some fine singing. Neil Caple is Needle Nugent, the local tailor who seems accommodating enough until he sees through the Captain and his mounting debt. Mary’s jilted first love Jerry Devine is similarly mild mannered, but there’s fire in him in Fionn Walton’s performance, kindled by both political beliefs and by the discovery that Mary has betrayed him, and his standards, in more ways than he could have imagined possible. Maggie McCarthy plays Mrs Tancred, a neighbour whose own pain over her son’s fate is a sinister precursor of events to come. Finally, in an ensemble role, is Jonathan Charles, whoalso displays some fine violin playing. Originally a play in three acts, this production cuts the first interval giving us a opening half that runs for over 90 minutes, but the effect is to maintain the dramatic flow and time stands still. A rapid and dramatic scene change is accompanied by some wild music that would be grand at any céilidh. Music is used sparingly but to good effect, having a reason to be there whenever it appears but leaving the words their stillness when they need it. Peter Coyte, who has worked on a number of Gemma Bodinetz’s productions, once again provides a score that adopts the sound and atmosphere of the play, using traditional instruments and performance styles to great effect. Members of the cast play one two or even three different instruments, mostly upon the chaotic mountain of debris but occasionally amidst the action, and all accompanied by Fergus O’Hare’s deft sound design. Lighting by Natasha Chivers is as subtle as the colour palette of the set and costumes enabling moments of visual drama to receive due prominence, including the suspended closing scene. 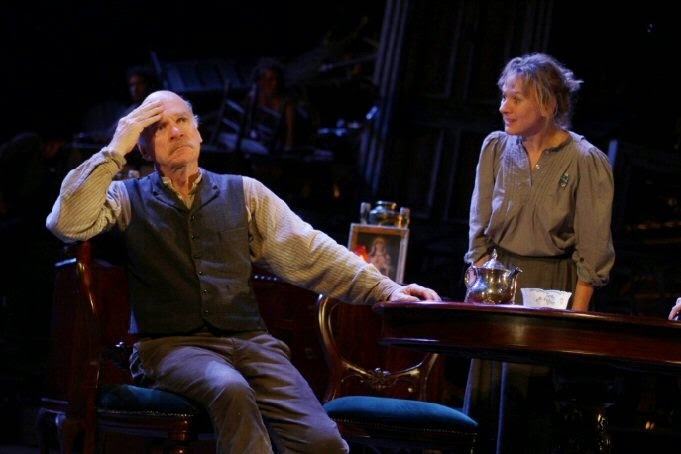 The world is still in a state of chaos, and this play has resonance with our times in more ways than Sean O’Casey may have imagined ninety years ago. The characters who populate this play have the power to show us that there’s a little of the spirit in us still and Gemma Bodinetz presents us with a paean to the indomitable human spirit. Juno and the Paycock is a co-production between Liverpool Everyman & Playhouse and Bristol Old Vic. It is the first play in 11 years that Gemma Bodinetz has opened away from her base in the Liverpool theatres, and having already enjoyed a hugely successful run in Bristol it continues at Liverpool Playhouse until 18th October.